A satellite is an object in space that orbits or circles around a bigger object. There are two kinds of satellites: natural (such as the moon orbiting the Earth) or artificial (such as the International Space Station orbiting the Earth). There are dozens upon dozens of natural satellites in the solar system, with almost every planet having at least one moon. Saturn, for example, has at least 53 natural satellites, and between 2004 and 2017, it also had an artificial one — the Cassini spacecraft, which explored the ringed planet and its moons. Artificial satellites, however, did not become a reality until the mid-20th century. The first artificial satellite was Sputnik, a Russian beach-ball-size space probe that lifted off on Oct. 4, 1957. That act shocked much of the western world, as it was believed the Soviets did not have the capability to send satellites into space. Following that feat, on Nov. 3, 1957 the Soviets launched an even more massive satellite — Sputnik 2 — which carried a dog, Laika. 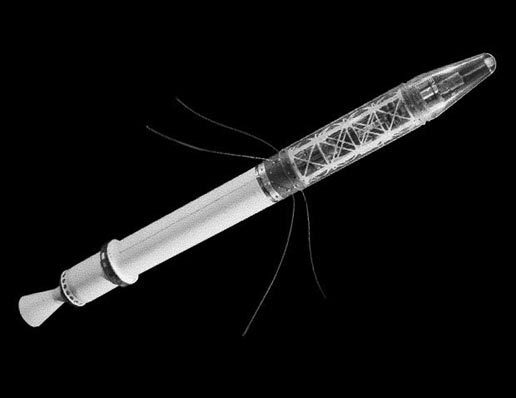 The United States’ first satellite was Explorer 1 on Jan. 31, 1958. The satellite was only 2 percent the mass of Sputnik 2, however, at 30 pounds (13 kg). With the miniaturization of computers and other hardware, it’s now possible to send up much smaller satellites that can do science, telecommunications or other functions in orbit. It’s common now for companies and universities to create “CubeSats”, or cube-shaped satellites that frequently populate low-Earth orbit. These can be lofted on a rocket along with a bigger payload, or sent from a mobile launcher on the International Space Station (ISS). NASA is now considering sending CubeSats to Mars or to the moon Europa (near Jupiter) for future missions, although the CubeSats aren’t confirmed for inclusion. The ISS is the biggest satellite in orbit, and took over a decade to construct. Piece by piece, 15 nations contributed financial and physical infrastructure to the orbiting complex, which was put together between 1998 and 2011. Program officials expect the ISS to keep running until at least 2024. Every usable artificial satellite — whether it’s a human or robotic one — has four main parts to it: a power system (which could be solar or nuclear, for example), a way to control its attitude, an antenna to transmit and receive information, and a payload to collect information (such as a camera or particle detector). As will be seen below, however, not all artificial satellites are necessarily workable ones. Even a screw or a bit of paint is considered an “artificial” satellite, even though these are missing these parts. What keeps a satellite from falling to Earth? A satellite is best understood as a projectile, or an object that has only one force acting on it — gravity. Technically speaking, anything that crosses the Karman Line at an altitude of 100 kilometers (62 miles) is considered in space. However, a satellite needs to be going fast — at least 8 km (5 miles) a second — to stop from falling back down to Earth immediately. If a satellite is traveling fast enough, it will perpetually “fall” toward Earth, but the Earth’s curvature means that the satellite will fall around our planet instead of crashing back on the surface. Satellites that travel closer to Earth are at risk of falling because the drag of atmospheric molecules will slow the satellites down. Those that orbit farther away from Earth have fewer molecules to contend with. There are several accepted “zones” of orbits around the Earth. One is called low-Earth-orbit, which extends from about 160 to 2,000 km (about 100 to 1,250 miles). This is the zone where the ISS orbits and where the space shuttle used to do its work. In fact, all human missions except for the Apollo flights to the moon took place in this zone. Most satellites also work in this zone. Geostationary or geosynchronous orbit is the best spot for communications satellites to use, however. This is a zone above Earth’s equator at an altitude of 35,786 km (22,236 mi). At this altitude, the rate of “fall” around the Earth is about the same as Earth’s rotation, which allows the satellite to stay above the same spot on Earth almost constantly. The satellite thus keeps a perpetual connection with a fixed antenna on the ground, allowing for reliable communications. When geostationary satellites reach the end of their life, protocol dictates they’re moved out of the way for a new satellite to take their place. That’s because there is only so much room, or so many “slots” in that orbit, to allow the satellites to operate without interference. While some satellites are best used around the equator, others are better suited to more polar orbits — those that circle the Earth from pole to pole so that their coverage zones include the north and south poles. Examples of polar-orbiting satellites include weather satellites and reconnaissance satellites. What stops a satellite from crashing into another satellite? There are an estimated half-million artificial objects in Earth orbit today, ranging in size from paint flecks up to full-fledged satellites — each traveling at speeds of thousands of miles an hour. Only a fraction of these satellites are useable, meaning that there is a lot of “space junk” floating around out there. With everything that is lobbed into orbit, the chance of a collision increases. Space agencies have to consider orbital trajectories carefully when launching something into space. Agencies such as the United States Space Surveillance Network keep an eye on orbital debris from the ground, and alert NASA and other entities if an errant piece is in danger of hitting something vital. This means that from time to time, the ISS needs to perform evasive maneuvers to get out of the way. Collisions still occur, however. One of the biggest culprits of space debris was the leftovers of a 2007 anti-satellite test performed by the Chinese, which generated debris that destroyed a Russian satellite in 2013. Also that year, the Iridium 33 and Cosmos 2251 satellitessmashed into each other, generating a cloud of debris. NASA, the European Space Agency and many other entities are considering measures to reduce the amount of orbital debris. Some suggest bringing down dead satellites in some way, perhaps using a net or air bursts to disturb the debris from its orbit and bring it closer to Earth. Others are thinking about refueling dead satellites for reuse, a technology that has been demonstrated robotically on the ISS. Beyond the asteroid belt, are four gas giant planets that each have a pantheon of moons. As of late 2017, Jupiter has 69 known moons, Saturn has 53, Uranus has 27 and Neptune has 13 or 14. New moons are occasionally discovered – mainly by missions (either past or present, as we can analyze old pictures) or by performing fresh observations by telescope. Saturn is a special example because it is surrounded by thousands of small objects that form a ring visible even in small telescopes from Earth. Scientists watching the rings close-up over 13 years, during the Cassini mission, saw conditions in which new moons might be born. Scientists were particularly interested in propellers, which are wakes in the rings created by fragments in the rings. Just after Cassini’s mission ended in 2017, NASA said it’s possible the propellers share elements of planet formation that takes place around young stars’ gassy discs. Even smaller objects have moons, however. Pluto is technically a dwarf planet. However, the people behind the New Horizons mission, which flew by Pluto in 2015, argue its diverse geography makes it more planet-like. One thing that isn’t argued, however, is the number of moons around Pluto. Pluto has five known moons, most of which were discovered when New Horizons was in development or en route to the dwarf planet. A lot of asteroids have moons, too. These small worlds sometimes fly close to the Earth, and the moons pop out in observations with radar. A few famous examples of asteroids with moons include 4 Vesta (which was visited by NASA’s Dawn mission), 243 Ida, 433 Eros, and 951 Gaspra. There are also examples of asteroids with rings, such as 10199 Chariklo and 2060 Chiron. Many planets and worlds in our solar system have human-made “moons” as well, particularly around Mars — where several probes orbit the planet doing observations of its surface and environment. The planets Mercury, Venus, Mars, Jupiter and Saturn all had artificial satellites observing them at some point in history. Other objects had artificial satellites as well, such as Comet 67P/Churyumov–Gerasimenko (visited by the European Space Agency’s Rosetta mission) or Vesta and Ceres (both visited by NASA’s Dawn mission.) Technically speaking, during the Apollo missions, humans flew in artificial “moons” (spacecraft) around our own moon between 1968 and 1972. NASA may even build a “Deep Space Gateway” space station near the moon in the coming decades, as a launching point for human Mars missions. Fans of the movie “Avatar” (2009) will remember that the humans visited Pandora, the habitable moon of a gas giant named Polyphemus. We don’t know yet if there are moons for exoplanets, but we suspect — given that the solar system planets have so many moons — that exoplanets have moons as well. In 2014, scientists made an observation of an object that could be interpreted as an exomoon circling an exoplanet, but the observation can’t be repeated as it took place as the object moved in front of a star. Next Post What is a VSAT?